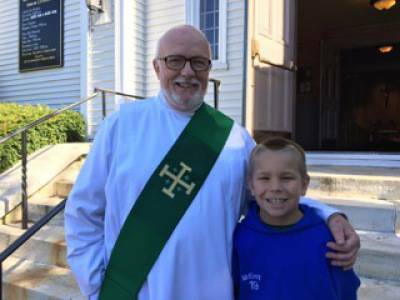 Deacon Jim McElroy was born in Boston, Massachusetts, growing up and attending school in the Greater Boston area. He attended St. John’s Seminary in Brighton, Mass. from which he obtained his B.A. in Philosophy in 1969. After nearly two years of study in the Theology School at St. John’s, Jim left the Seminary to pursue a career in law. He graduated in 1974 from Suffolk University Law School in Boston with his Juris Doctor degree. While in school he worked part time as an orderly at St. Elizabeth’s Hospital in Boston. It was there that he met Suzanne Tessier whom he married on January 15, 1972. In 1975, after a year practicing law in Wakefield, Mass. Deacon Jim and Sue and their two year old daughter Erin moved to the Berkshires, settling in Great Barrington. In August of 1976 their son Tim was born. Jim established his law practice in Great Barrington, practicing throughout Berkshire County from 1975 through 1992. In October of 1992 he was appointed a Justice of the Massachusetts District Court by Gov. William F. Weld who swore him in on January 22, 1993. Thereafter, he served as the First Justice of the Southern Berkshire District Court until his retirement on March 21, 2011. During his final four years as a judge, Deacon Jim attended classes two nights a week at Elms College in Chicopee in the Diocese of Springfield Diaconate Formation Program. He was ordained a deacon on May 21, 2011 by Bishop Timothy A. McDonnell and was assigned to serve the parish of St. Mary Mother of the Church in Lee. Deacon Jim also serves as an Advocate in the Tribunal of the Diocese of Springfield. Deacon Jim and Sue now reside in Stockbridge and frequently enjoy the company of their daughter Erin and her husband Lonnie and their three daughters and their son Tim and his wife Nicole and their daughter and son.